On Sunday, my airsofting brothers and I held an airsoft event on behalf of the little kids at Great Ormond Street Children’s Hospital. 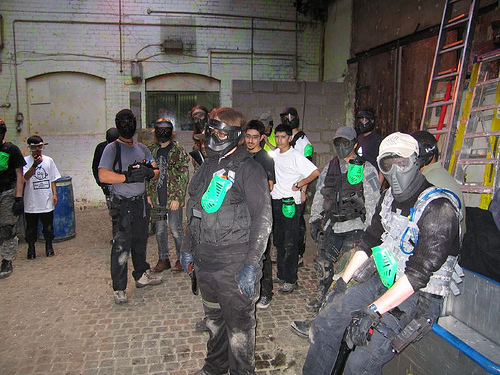 Many people gave up their time and gave across their money for the event, including the Electrowerkz site owner’s, marshals, medics and players. The net result was a combined donation of £1816.68 to the charity. Well done everyone, we did airsoft proud yesterday. Pediatric Hospitals do some of the most important and heart breaking work and anything, anything, that will help is help well received. 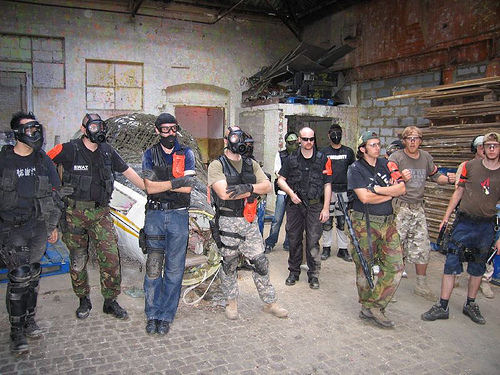 For us to raise £1800 quid running an airsoft event shows that this is not a low and selfish sport, rather it is an emerging and fledgling community that if allowed to survive has everything to offer. Today, we can hold our heads up that little bit higher and tomorrow some little kid is going to get a brighter future because we are airsofters and we care. So how did such an event come about and how did it go down? 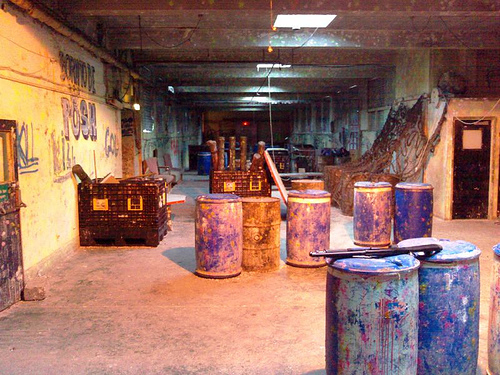 Well, it started as a set of discussions over whether it was possible to run a single shot only day at Electrowerkz. Gauntlets were thrown down and picked up. This combined with the long held urge to do something for charity led to the rather brilliant idea of mixing the two and holding them on a weekend. My involvement came about through my regular Tuesday night stints as a safety marshal for Andy. I leapt at the chance to be able to get involved and lend a hand. …and sporting all manner of single-shot airsoft guns we kicked off the day. 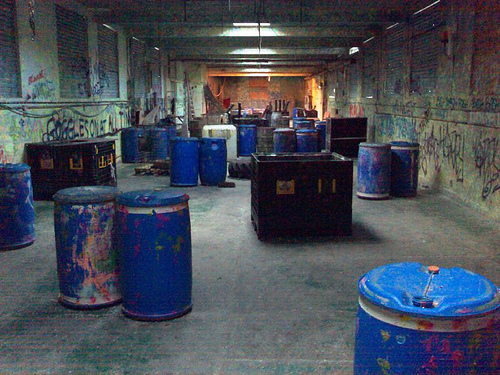 The way the day was organised meant that there were no rental “newbies” onsite and we were looking a fairly strong turn out of dedicated airsofters. The first few games soon set the tone for the day and the standard of play was very high. Electrowerkz has recently had some changes to the layout and the ground floor now sports a new regen point in a previously covered stairs. This meant that even long term players, like the resident DarkAngel’s, were pushed to dominate. In order to keep things running smoothly the large marshaling team was split into two, with one team playing and one marshalling. This way, if one side looked like unbalancing the game the player-marshals could be ordered to switch sides in order to even things out a little better. One the top floor the opposing flag colours were separated by the length of the floor. Each team had to come up from the ground floor and capture the opposing team’s flag and transport it back down their stairs. However, the staircase that the teams came up was at the opposite end to their flag, so it was necessary to fight across the top floor to get to their flag. In another subtle twist, each team was allowed two defenders. They could start on the top floor under the opposition’s flag and could hide within 3m’s. This meant that anyone super fast, who got up the stairs before the opposition, still had a (small) battle on their hands to achieve the goal. I was one of the defenders and had great fun keeping people at bay using my shotgun and dual pistols. Credit has to go to head honcho, DA leader and event organiser; Lex for coming up with such excellent scenarios. I have to say that when I was marshalling I saw very little in the way of cheating or unsportsmanlike behavior. This is a sign of a well run event! My load out for the day was my new “recon” load out that I have designed for summer play or play in woodland, where my full “Assault” rig would be too heavy/hot. 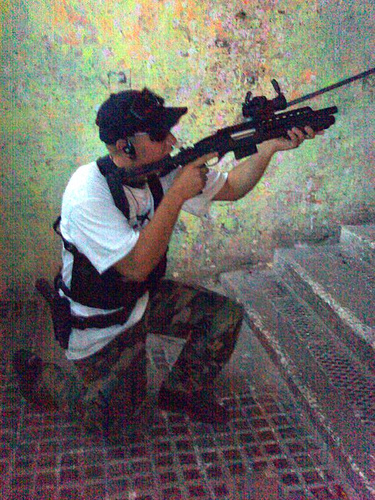 I was wearing a recon assault harness with my pistols moved up from my hips (where they normally live) to my pits using a dual shoulder holster. 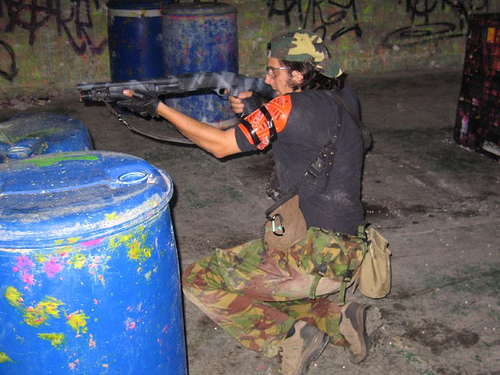 I also had on my Chalker sling that holds the gun but center of the chest enables fast shoulder swapping in battle. To keep cool I was using a 3L insulated drinks pouch attached to my back. Using this load out I could move significantly faster than normal without sacrificing a protection to the torso and ability to carry weapons. It worked really well! A highlight for me was in the “Magnificent 7” game, where the marshals took on the rest of the players and fought a retreating action through the building. In the final room, the “last stand”, I put my pistols down onto a barrel and blasted away with the shotgun. Too soon I was out of ammo and forced to retreat as I did so a guy slid through the door on his knees. 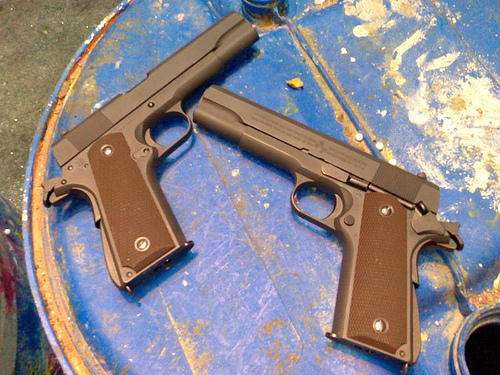 Instinctively I reached down to the barrel and picked up both pistols in one hand and opened fire. It was really a shock for the poor fellow to get hit with double the amount of bb’s in a short space of time! Both pistols firing on one hand looked funny strange to say the least. 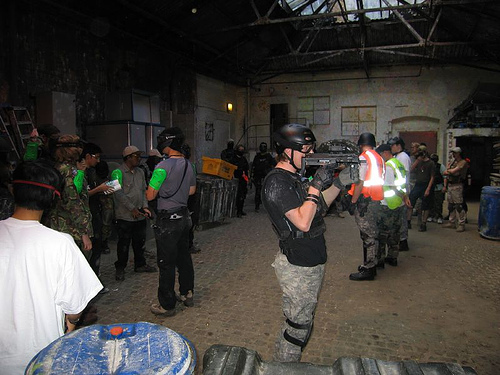 In the end I hope that this will be the first of many single shot airsoft events at Electrowerkz as the atmosphere was excellent and the crowd good fun to be with. I eventually arrived home at 10pm, tired and happy. A great experience and a worthy cause. Some shots to Trip lookinf very Geardo, like he was in Iraq or something! Movie 1. Whilst I marshal the greens and reds flood into the top floor and get ready for battle.